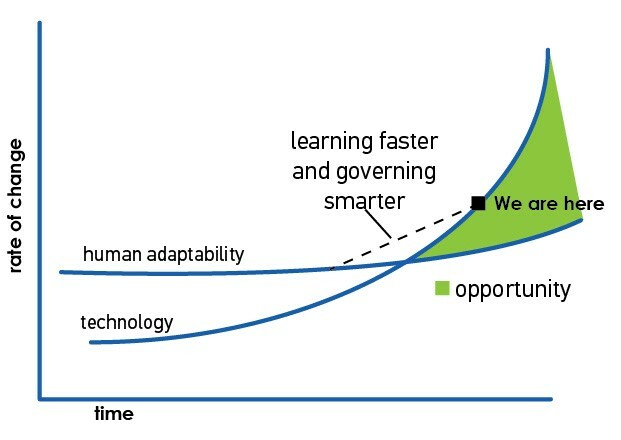 For those of us who are visually inclined, I wanted to share an interesting chart (above) that I dub “The Technology Adoption Drag.” It illustrates scientific and technological progress over time and how humanity — individuals and society — adapts to changes in the environment. It shows how, over time, we have adapted, and in most cases, drove the changes and accepted them. Thomas Friedman in his new book, Thank You for Being Late, explains this theory as well as the changes in the curve, which are based on a conversation with Astro Teller of Google. This graph illustrates how exponential technologies and our rate to absorb and diffuse them is dragging. We simply can’t keep up with the rate of change and incorporate all these new things and information. People must change in this new “dynamic stability” model of organizational and personal lifelong learning. Teller goes on to say that the only thing that can be stable in this environment is the “bicycle effect,” where motion brings stability in area of constant change. The graph below illustrates the market upside, and I shaded it green to show the opportunity. The Industrial Internet of Things (IIoT) must make and help humans and industries adapt by making it relevant. That’s possible by combining technological innovation (product) with domain expertise (differentiation) and strong network partners (sales). For example, by going the extra mile, organizations can focus on vibration signature analysis on specific pumps to realize significant cost savings in a plant and integrate in the customer’s workflow to push innovation at the edge. Those organizations that can execute on that promise will be big winners.